Confession time: I have an awful habit of flipping through a book to look at some of the other chapters or the END, when I pick up a book to start reading it. I try to resist, but the temptation gets much worse, especially when I know I have a story-ending, series-ending book in my hands. 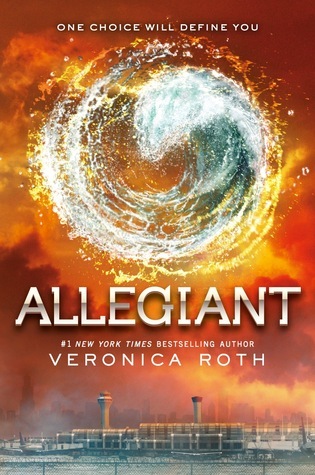 So… those of you who have read Allegiant know what I found when I skipped over to the end of the book. While I applaud Roth for making such a tough decision, especially in the Young Adult genre, I really, really didn’t want to read the book after that. Luckily, this was the only book I had with me while waiting for my flight back from San Francisco to San Diego, so I read a large portion of it in one sitting. I don’t really mind spoiling books for myself because, while I skip around because I’m impatient, I still really enjoy seeing how they get from point A to point B, so it doesn’t take any of the fun out of the reading book for me. Normally. Much of this story deals with what Tris and Four find outside the fence. The world-building and explanation for how the Divergent series story arc came to be was fascinating. But it was a little too back and forth, I’m not sure who I’m supposed to trust, who’s good, who’s bad. But as always, the writing is engaging and kind of makes the plot confusion irrelevant. The last seventy or so pages of the book were just amazing. I cried so much. I felt all the feelings. I woke my boyfriend up from his nap and made him hold me while I felt like my world was breaking apart. So. Many. Feels. Also, that scene where Four is in his old house, shaving his head? God. Damn. Killer. No review of the Divergent series is complete without a commentary on Roth’s age, but yeah…gimme your skillz. I wantz them. This was probably my favorite book of the series and it wasn’t because of the story, but the way the writing pulled it off and questioned pretty much everything we know about ourselves and our lives and how we relate to each other. Also, Roth has some insane insight into relationships, particularly romantic ones, that are worth highlighting, quoting, and sending on million-year circuits around the internet. No way I’m ever reading this now . . .
You have to read it if you love the series! 🙂 Some love it, some hate it, but I still say it’s necessary to finish out this series. I for one, enjoyed it a lot but not quite as much as the first two. So excited to see the move this weekend though! If this comment was directed at me . . . I meant the whole series. If it was not directed at me, nevermind. I think I liked this one the best too! And I’m totally like you, I hate when they change the view point up! It drives me bonkers.